Wordsmiths fancy they could govern quite well, if only they cared to. Neither the skills nor the knowledge base of oration or of writing—especially fiction, although it’s also true of writing in general—are readily transferable to forming and implementing policy, although they’re not necessarily mutually exclusive. Did Anderson ever watch a tape of Truman giving a speech? He makes McCain look like Churchill. Truman was not good at oration—but he is now thought of as having been a good president although his popularity, like Bush’s, was very low when he left office. Perhaps the latter fact is an indication that good speechmaking is helpful for selling one’s policies and bad speechmaking handicaps a president who is involved in a complex and difficult war, such as the Korean or the Iraq wars. Reality is reality; words are words. No logical path connects the two. Being able to discuss with reverent rapture the virtues of the ’68 Mustang Shelby does not begin to equip you to repair one. Knowing how to explain what McClellan his opportunity for a glorious victory at Antietam does not enable you to command an army. And being able to excite the voters does not equate to being able to govern them. I do not broach a new idea (there are very few such things). The ancient Greeks hashed this business out centuries before Christ. The Sophists were well aware of the gulf between words and truth. Some of them, like Gorgias, stated so bluntly, and drew the ire of Socrates for their trouble. 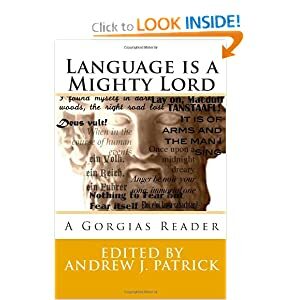 And some goodly fellow just published a tome of Gorgias’ extent works, so that people can read about the vast difference between what can be spoken and what is true. Next Next post: So, That Happened.